Spring is in full swing with this new gorgeous and affordable new collection from Sylvia. If you're looking for a new piece to add to your jewellery collection this spring look no further... Not only is this range to die for it's also affordable, perfect for a pick me up or to treat a loved one. Making no compromises on design or quality this new purse-friendly range is made from solid silver with the added charm of a real crystal. "A fresh, youthful jewellery collection made up of solid silver necklaces, bracelets and earrings inspired by stirrups, horseshoes and snaffle bit." - Silver necklace measures 48mm x 15mm approx. - Chain can be worn at 18 or 16 inches long. - SK Jewellery logo tag. 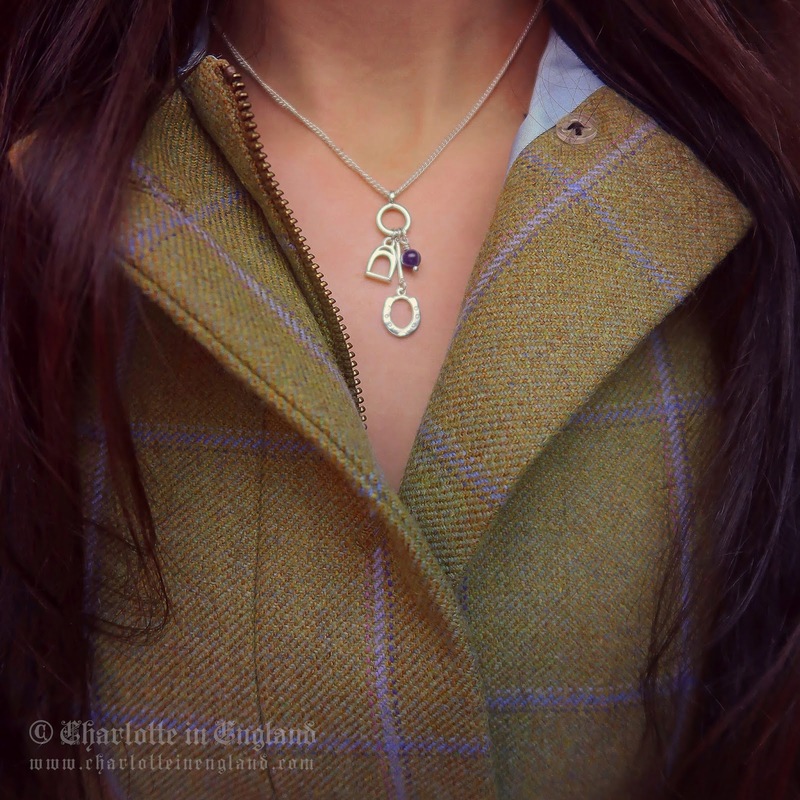 "Why not spruce up your look this spring with this fantastic new equestrian jewellery range?" I could not resist taking some photos with my own amethyst crystal and the alluring 'Divinity' bath bomb from Hex Bomb. 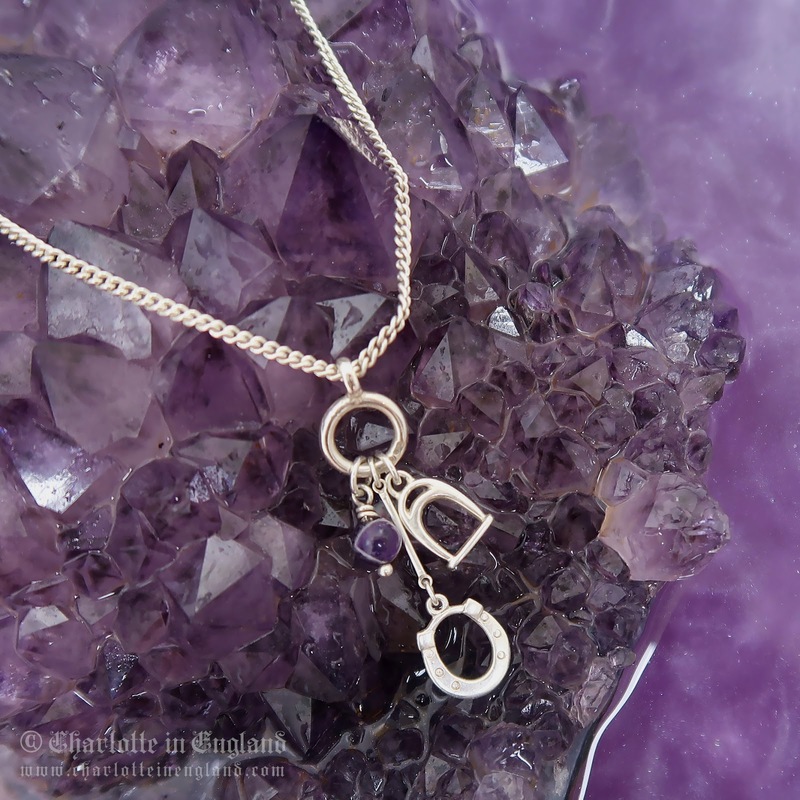 "This unique design features our silver horseshoe, stirrup and real Amethyst charms hanging a varying lengths, from a solid silver circle." "The whole range is really lovely, designed to stack together they create a layered look which is modern and fresh. Team it with other pieces from the new SKJ range you're bound to turn heads." The Chain can be worn at 18 or 16 inches long. I wear mine at 16 inches. Being a big crystal lover I couldn't wait to get my hands on this beauty. 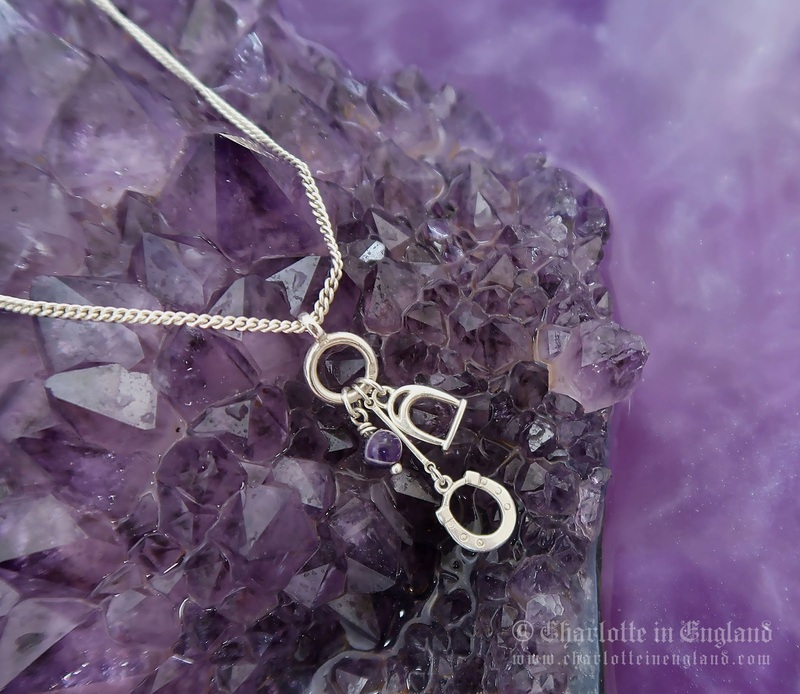 Featuring a real amethyst crystal it adds a really charming element to silver jewellery. The whole range is really lovely, designed to stack together they create a layered look which is modern and fresh. Team it with other pieces from the new SKJ range (there's 13 in total - see above for inspiration) you're bound to turn heads. 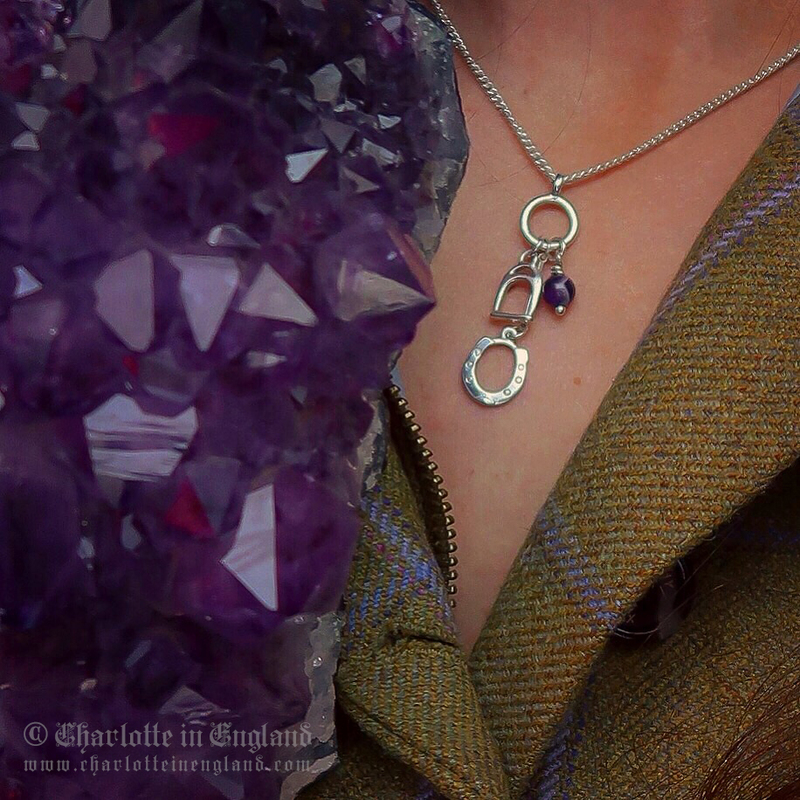 Being as most of Sylvia's designs are equestrian influenced I like to mix and match my Silver Horseshoe, Stirrup & Amethyst Crystal necklace with my existing jewellery from her different ranges and I love the way it all works together. The pendant I am wearing features a horseshoe, stirrup, and crystal. They all hang at different lengths so it creates a gorgeous layered necklace with different 'charms'. They hang from a single solid silver circle so the finishing product looks clean & neat. There is also another choice of necklace with the stirrup sitting longer than the horseshoe CLICK HERE to see... Do you love charm jewellery? I'd love to have the option of having interchangeable/detachable SKJ charms so I could mix the charms up with the rest of the SKJ range (on the chain bracelets and necklaces) - possibly an elegant horse head, riding crop, riding hat, the Sylvia Kerr horse silhouette, riding boot, etc oh and wouldn't different crystals (maybe based on Birth stones or healing properties) be a great option too? - I think these could work really well. If you're still admiring Sylvia's gorgeous jewellery but have yet to make a decision why not start with something from this gorgeous new affordable range? You won't be disappointed. I've worn mine almost every day since it arrived and I'm sure it's on a lot of other peoples wishlists! Other semi-precious stones available, message Sylvia here for details. Why not spruce up your look this spring with this fantastic new equestrian jewellery range? All opinions are my own and I will always be honest and truthful. 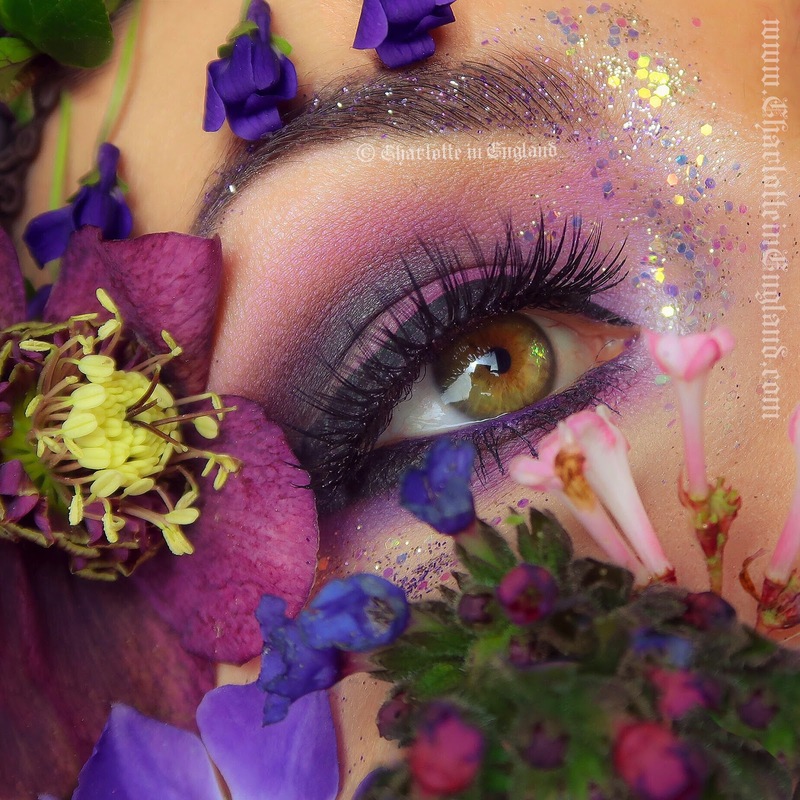 Design, photography, wording. opinions and quotes (in gold and black) by self. I'd love to know your thoughts!